Overassen AS produces the large snow blowers in Gjovik, Norway. The end user was looking for a reliable, well documented, and approved fire extinguishing system that could fit in the engine compartment. Stat-X® fire suppression system became the answer to the challenge because we have the Swedish bus approval, which felt comfortable and “close to home.” Further our customer needed a distributor that could support and install the system. The Stat-X light weight and pressure-free system showed to be attractive. 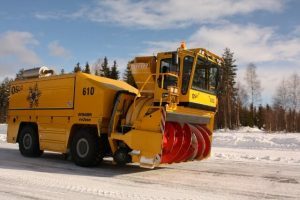 Snow plowing and blowing vehicles are used to clear the snow from runways in airports, from railway tracks, and from the roads during winters in region with heavy snowfall. These vehicles are big structures which house engines, batteries, electrical wiring, and fuel tanks inside them to perform the intended task. The traditional method of fighting fires in this type of equipment is a handheld extinguisher, which is not effective for these kinds of applications because handheld extinguishers are not automatic, the delay gives time for the fire to spread and sometimes makes it harder to extinguish. 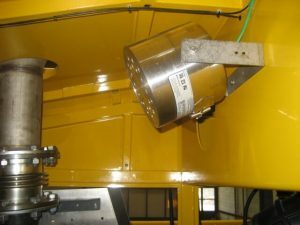 Also, the engine closure and other areas in these vehicles is small and restrict easy manual access which makes it difficult to install a conventional fire suppression system. Most of these fires belong to Class A, Class B, and Class C fires which are initiated by the above causes. For example: an oil, hydraulic fluid, or a fuel leak cause liquids to come into contact with areas of the vehicle which are hot enough to ignite them, this leakage can be due to a poor maintenance. The fire resulting due to this cause falls into Class B category. Stat-X has been listed by Underwriter’s Laboratory (UL) for Class A, Class B and Class C fires as a suppression technology for fighting these fires by using a total flooding technique by breaking the chain reaction of combustion without any depletion in the normal levels of oxygen. Also, listed to operate at a temperature of -40 o C.
Stat-X is also tested for military standards, where it successfully passed the vibration, shock, temperature shock, water, and oil immersion tests. In this application, Stat-X electrical activation system is installed with a linear heat detection cable, being a light weight and pressure free system made it easy and safe to install. Since these vehicles are mobile the fire suppression systems can be installed without removing the equipment from service. If the Stat-X system is removed for re-installation, it can be installed easily since it doesn’t require any piping and complex electrical wiring. Stat-X generators can also be operated manually by including a manual pull cable or guarded toggle switch as part of the installation package. This is a photo of the engine compartment. 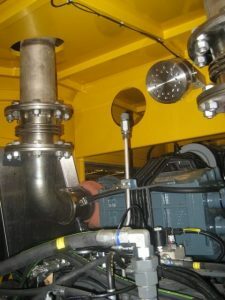 The generator is mounted to the upper right. The control panel used is SP-1 and detection is made with heat sensitive cable.